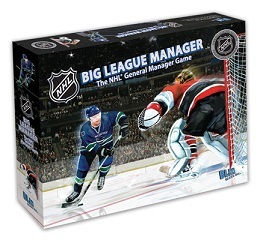 Strategies Games - Board Games Big League Manager: Platinum Edition BLM Games INC.
Big League Manager Hockey is a board game all about being a hockey General Manager. This board game features player trading cards, dice, roster sheets and a very attractive board. The object of the game is to build the strongest team of players best able to win hockey games all while balancing the difficult task of being a general manager. Your team is then pitted against your opponents. The winner of 5 games wins the match.